Irene Loves Elephants: July 25th Run Mickey Run! But before you run Mickey, I have to warn you. This is a trap! Well for the first time ever, that we are aware of, we may have a mouse in the house. And hopefully a solitary mouse and not a whole family and their seven cousins and their families residing in the roof. There has never been any evidence of mice activity in the house before, ie little black pellets indicating they are pooing everywhere. But George was up very early and he did spy, from the corner of his little eye, a mouse go fleeting by. And out of the old coal range of all places. Poor George spent the day wondering how to deal with the problem, thinking I would go into mass panic mode when he came home with not one but four traps. But having lived in the country, my fear extends more to rats (one day I will tell you the story of how I had to kill one with my own bare hands whilst holding a shovel, so I could exit a shed - but that is another tale). So the trap is set with a delectable dinner of peanut butter, ham and cheese. Why not indulge a mouse three courses, for his last supper? And we wait. Will Mickey take the bait? Is there only one Mickey in the house? 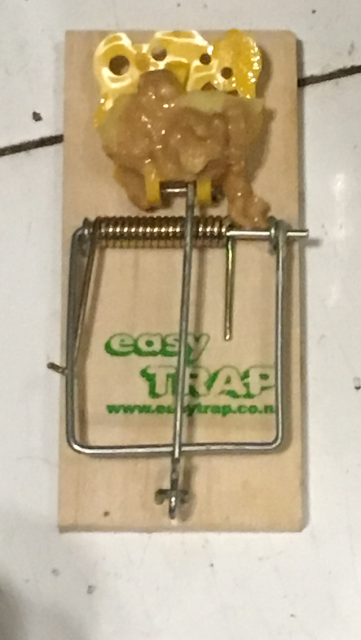 Who will empty the trap? Watch the next episode for answers to all these questions and more, including what is the meaning of life?